From far, the two-storey shophouse that sits at the junction of Jalan Kemaman and Balestier Road looks like a boring, plain white building amid the many more colourful shophouse units nearby. Go closer, however, and one would be struck by the ornate details in the plaster work on the facade. 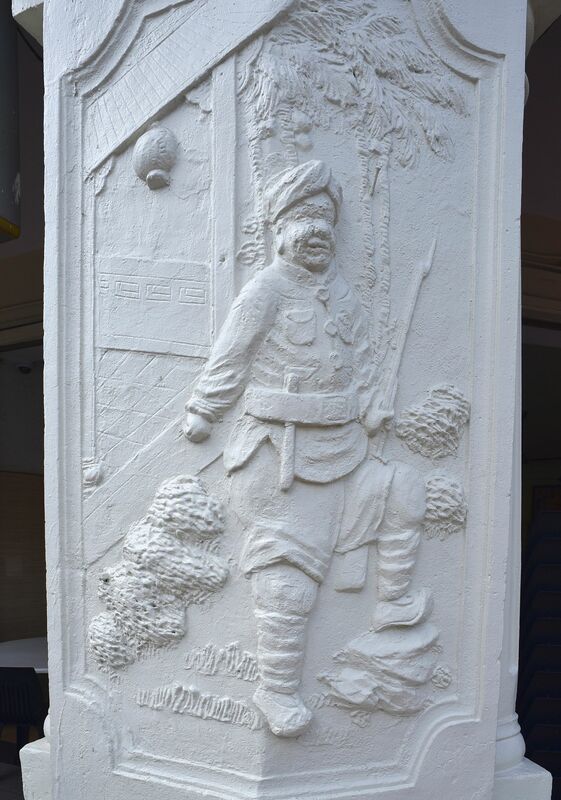 Two Sikh guards are crafted on the columns at the entrance. Pineapples, cherubs and monkeys adorn the walls. On the pediment are two buffaloes. Look a little closer and you will find peacocks, dragons and bats. There are also strips of glazed ceramic tiles with floral designs positioned neatly beside the green framed glass windows, which would originally have been wooden slat windows. Mr Kelvin Ang, director of conservation management at the Urban Redevelopment Authority (URA), says: "It has a rojak character in a positive way." But, he adds, what seems to be a random collection of animals is actually a reflection of auspicious symbols from the different races in Singapore. For example, the Chinese word for bat, "fu", sounds similar to the Chinese word for prosperity, while peacocks represent virtues such as patience and compassion in Hindu culture, and symbolise beauty and peace in Chinese culture. The shophouse at 412 Balestier Road was built in 1928 by businesswoman Sim Cheng Neo and designed by architect Kwan Yow Luen. Today, the ground floor is occupied by Hong Kong Street Chun Tat Kee coffee shop. It is not known who occupies the second floor, but the building, conserved in 2003, is privately owned. The expensive plaster artwork is a flamboyant display of wealth and done in the Straits Baroque style - Asian symbolisms moulded in the ornate Baroque style of the West - which is unique to Singapore. However, because of its location along the busy Balestier Road today and its plain facade, many cars and pedestrians often whiz by without taking note of the building. But it is not just the ornate plaster work that most passers-by miss at first glance. Few know that the shophouse is a landmark close to the hearts of the Malay community because of its cameo in the cult 1950s Malay film, Penarik Beca (The Trishaw Rider). The film, which shot the late Malaysian actor P. Ramlee to fame, is a love story between a rich man's daughter and a poor trishaw rider played by Ramlee. Those who watched the film may remember the scene where he saves his love interest from a rowdy bunch of gangsters, which takes place in front of the shophouse. As to why it was chosen among the many shophouses in Balestier, Mr Ang says it could have been because it was then a landmark building recognised by residents in the area. It could also be a matter of convenience and location, given the shophouse's proximity to the famous Malay Film Productions studio at 8 Jalan Ampas down the road. Mr Zainal Abidin, a member of the URA Conservation Advisory Panel, grew up watching Ramlee's films and recalls many fond memories of seeing the shophouse. The 55-year-old says: "By preserving a physical part of Singapore, people can relive and experience it for themselves and not just through the recollections of their grandparents or older relatives." •This is a monthly column on heritage buildings.